Roberto Clemente, a 15-time Major League Baseball All-Star died at the age of 38 in a plane crash bringing aid to earthquake victims in Nicaragua. A member of the Pittsburgh Pirates, Clemente earned 12 Golden Gloves and four National League batting titles and his Major League career and posted a career batting average of .317. 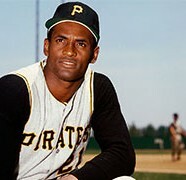 Clemente learned that much of the cargo being sent to the relief victims in Nicaragua was not being received. He decided to accompany the cargo in order to ensure that it would arrive as planned. The plane carrying him crashed shortly after takeoff off the coast of Isla Verde, Puerto Rico. The plane has had a history of mechanical problems and was overloaded by more than 4,000 lbs. Clemente was survived by his wife Vera and three children and was elected to the Baseball Hall of Fame the year after his death.